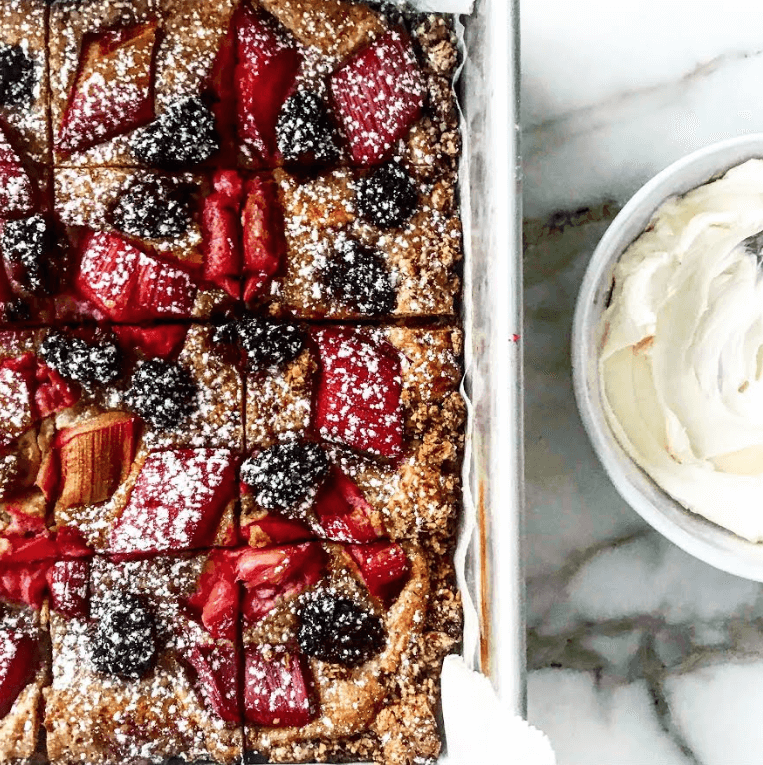 These Seed + Mill Tahini Blackberry Rhubarb Almond Bars have a crisp tahini almond flour crust topped with soft almond frangipane, fresh blackberries and tart rhubarb. They are paleo, gluten-free and refined sugar free! 1. Preheat oven to 350°F and line an 8×8″ square pan with parchment paper. Grease with nonstick cooking spray. 2. In a mixing bowl, stir together all ingredients for the crust until fully combined, and there’s no dry flour remaining. Press the crust evenly in the pan. 3. In a food processor or blender grind the almonds, tapioca flour, salt and coconut sugar for the topping to a powder (or as fine as you can make it). Add the coconut oil and tahini and process until no longer visible. Add the egg and vanilla, blending until completely incorporated, and a smooth paste is formed. Spread the filling evenly over the almond crust. 4. Toss the fruit with the lemon zest and juice and evenly spread over the almond paste. 5. Bake for 40 minutes, or until set and a skewer inserted into the center comes out clean. 6. Let cool completely before cutting into squares. 7. Keep any leftovers in the fridge in an airtight container. You can find Seed + Mill at Swing into Spring on April 24th for a free jar of freshly milled tahini with purchase.